This CellML version of the model has been checked in COR and PCEnv and it runs in PCEnv to recreate the results in figure 3. The model will not run in COR because it contains a remainder function. The units have been checked and they are consistent. Abstract: Transcription by the nuclear factor of activated T cells (NFAT) is regulated by the frequency of Ca(2+) oscillation. However, why and how Ca(2+) oscillation regulates NFAT activity remain elusive. NFAT is dephosphorylated by Ca(2+)-dependent phosphatase calcineurin and translocates from the cytoplasm to the nucleus to initiate transcription. We analyzed the kinetics of dephosphorylation and translocation of NFAT. We show that Ca(2+)-dependent dephosphorylation proceeds rapidly, while the rephosphorylation and nuclear transport of NFAT proceed slowly. Therefore, after brief Ca(2+) stimulation, dephosphorylated NFAT has a lifetime of several minutes in the cytoplasm. Thus, Ca(2+) oscillation induces a build-up of dephosphorylated NFAT in the cytoplasm, allowing effective nuclear translocation, provided that the oscillation interval is shorter than the lifetime of dephosphorylated NFAT. We also show that Ca(2+) oscillation is more cost-effective in inducing the translocation of NFAT than continuous Ca(2+) signaling. Thus, the lifetime of dephosphorylated NFAT functions as a working memory of Ca(2+) signals and enables the control of NFAT nuclear translocation by the frequency of Ca(2+) oscillation at a reduced cost of Ca(2+) signaling. 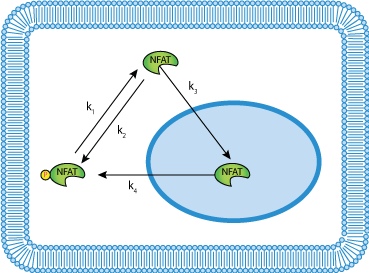 Schematic diagram of a model of NFAT translocation. NFAT assumes one of the three states, cytoplasmic phosphorylated, cytoplasmic dephosphorylated or nuclear transported. Rate constants are defined as indicated. The dephosphorylation rate constant (k1) was assumed to be regulated by [Ca2+]i. Derived from workspace Tomida, Hirose, Takizawa, Shibasaki, Iino, 2003 at changeset 1b3428a09171.